THE Department of Social Development has, for the past 18 months, ignored a plan for the establishment of a state-run frail care facility in an under-used hospital, according to a former top official. If the facility had been set up, the furore over the fate of 239 frail care patients following the department’s decision to close the only two fully stated-funded facilities in Port Elizabeth would never have happened. Former Social Development director-general Bea Hackula, who was fired by Eastern Cape premier Phumulo Masualle this week after a disciplinary hearing, said yesterday she had finalised a plan in the middle of last year for a joint venture between the Social Development and Health departments to establish a large state-owned frail care centre at an under-used hospital. She said it would have had double the number of beds that the two Port Elizabeth facilities had. But in June last year, Hackula was ordered to swap places with the former head of the Department of Cooperative Governance, Advocate Stanley Khanyile. Hackula said she had been finalising a plan at the time to establish a state frail care facility to prevent further outsourcing of this service. 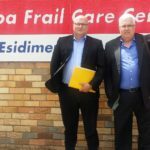 She had put out the tender for the R104-million two-year contract to look after the 239 Lorraine and Algoa frail care patients. “There would have been deaths otherwise. I made my decision to save lives,” she said. The contract had been signed after a tender process, but was not renewed in June this year and the centres were set to close at the end of this month. However, the Port Elizabeth High Court ordered last week that the contract be extended until the department can present the court and a curator with a proper plan to move the patients. Hackula said that in her disciplinary hearing she had been accused of irregularities in the Life Healthcare tender process. “I am accused of putting out a tender that was non-competitive because we required the service provider to have its own facility,” she said. “I went to those two facilities [in Port Elizabeth]. “I took my programme manager and the former chief financial officer. “I realised it would be inhumane and irresponsible of me not to look at who these people are. “Then I said: ‘We need a plan. You can’t just stick these people in an old age home or a home for disabilities. They need specialist care’. “The contract with Eastern Cape Frail Care [part of the Life Healthcare group] started before I arrived at the department. “For the 2015-16 contract, we put it out to tender and I appointed a committee to deal with the tender. “Officials from the treasury served on that committee. Now they are saying there was something wrong. “They say we created unfair competition because we required a dedicated facility for frail care. “The current frail care crisis in Port Elizabeth would have been averted if they had just implemented my plan. Hackula said her plan was to change one of the province’s underused hospitals into a frail care centre. “I spoke to many retired nurses who would have been honoured to be called back to help,” she said. “The centre would also have used doctors doing sessions and social workers. “It would have been a permanent, cost-effective solution. “Now they [Social Development officials] have wasted 18 months. She said the government would have kept control over the subsidies. Hackula said she would be fighting her dismissal. Dr Nilesh Patel, of Eastern Cape Frail Care, which runs the two centres, said he was not aware of any irregularities with the 2015-16 tender. Social Development MEC Nancy Sihlwayi had said in an interview on December 1 that she believed the agreement with Eastern Cape Frail Care was signed without a tender. Social Development spokesman Lwazi Jiba did not respond to a request for comment on Hackula’s allegations. Gerhard Lueck, from the Frail Care Crisis Collective – the group of families that took the department to court – said the latest revelations showed the department was allowing other issues to interfere with the care of patients. “Partnerships done in time could have provided us with a really good solution,” he said. “Personalities, politics and egos have scuppered what could have been a good plan.